I want to tell you my story about Salmon. How I discovered it and came to really love it! Right outside of the shop I worked at in Alaska was a creek named Ship Creek. It’s a river that flows from the Chugach Mountains to Cook Inlet. After work, some of us would go fishing. That’s where I had my first taste of wild caught Salmon. We took it to a friend’s house and cooked it on the grill with only salt, pepper, butter, and onion. It was one of the best dishes I had ever eaten. I still love to eat salmon to this day. I’ve done some research that will benefit both of us. Are you frustrated looking for healthy foods, fish or otherwise, that taste good? Have you tried all of the “healthy, low fat, low carb, and low whatever” alternatives only to find out that none of them taste good or are helping you lose weight? I think it’s safe to say, we’ve all been there. How about you? It seems like nowadays you need to make a choice between food that is healthy for you but doesn’t taste so good or food that tastes great but is really bad for you. Anyone agree? What if I told you that these are not the only two choices. I’ll ask you are you curious to know what they are and how they can benefit you to improve your health and life? And yes, sometimes finding healthy food alternatives is hard, but not impossible. And if you have looked for and are struggling to find some of these “superfoods”? Well, read on to learn more about one of the best overall, salmon. One of the most highly consumed superfoods. Even if you’re well versed in superfoods read this post. It can only help you. We’re going to list some “superfoods” that are both good for your health and taste great! This is the first part in a 3 part series about Superfoods. Rich in Omega-3 Fatty Acids. Salmon is one of the best sources of the long-chain omega-3 fatty acids EPA and DHA. May Reduce the Risk of Heart Disease. Let’s take an in-depth look at each one of these benefits so you can get the most out of each one. Now, I’m not sure if you can pronounce those words above or not. I know I have some difficulty with it. Am I right? What matters though is that we start incorporating these key nutrients into our diets. The health benefits are obvious. It’s never too late to start choosing a healthy diet and adopting a healthy lifestyle. You could start by incorporating just one new healthy element per week into your life. You’ll be glad you did. Click here to check current price on Omega 3 fish oil on Amazon. Click here to check current price on protein powder on Amazon. Please note that these requirements are for sedentary men and women. Your protein requirements may vary depending on many factors such as age, weight loss goal, or intent to gain muscle. Click here to check current price on B vitamins on Amazon. Click here to check current price of potassium supplements on Amazon. Click here to check current price of selenium supplements on Amazon. Click here to check current prices on weight loss supplements on Amazon. Here is an excellent, mouth-watering grilled salmon recipe from www.eatingwell.com. 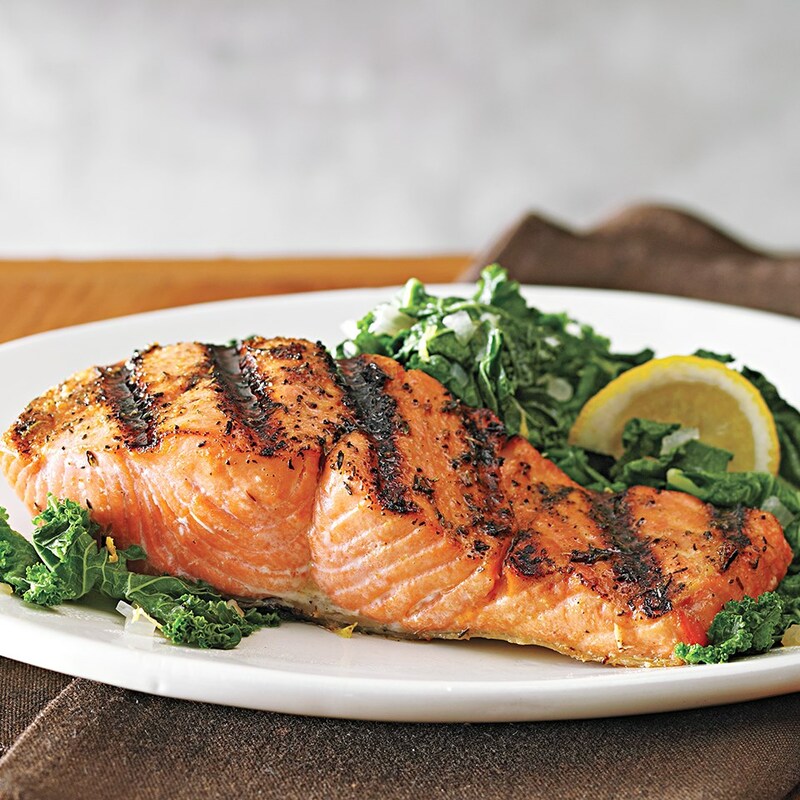 Check out their site for instructions on how to grill this up or try cooking it in an Air Fryer and while you’re there look for some more healthy great tasting ways to prepare salmon. Click here to see current prices on Air Fryers on Amazon. Wild caught salmon con: can be exposed to toxins like mercury and other trace metals in their natural environment. But, levels are generally so low in all kinds of salmon that it’s not a concern. Higher risk of contamination from toxic, cancer-causing chemicals, like PCBs (polychlorinated biphenyls) and dioxins. Usually, raised in poor, crowded conditions, with higher rates of bacteria, parasites, and diseases. Click here to see current prices on salmon on Amazon. After reading through several articles it is my opinion that wild caught salmon is a much healthier choice than its cousin farm-raised salmon. Wild caught salmon eat a more diverse diet which consists mostly of krill. Krill eat algae which are loaded with omega 3 fatty acids. Salmon eat the krill. These krill, in turn, give them their deep, rich, red color. When we eat the salmon we are benefiting from them eating the krill by being able to use the omega 3 for our own bodies. Which in turn leads to better health for our bodies. Omega-3s help reduce your risk of heart disease. This is especially important for those with type 2 diabetes, due to an already elevated risk of cardiovascular disease. Over time, high blood glucose levels can lead to increased deposits of fatty materials in blood vessels, which contributes to clogging of the arteries (atherosclerosis). Wild salmon is not only rich in omega 3s but also contains a healthy-fat and protein combination that slows the body’s absorption of carbohydrates, keeping blood sugars on an even keel. Which is why salmon is considered to be one of the best low glycemic index food choices for type 2 diabetics. Click here to check out current prices on glucometers and lancets on Amazon. This is the alarming headline of an article published June 11, 2018, by the Atlantic Salmon Federation. The article goes on to explain that the wild Atlantic salmon population had decreased by 15 percent in 2017 compared to the year before. Because of the recently concluded 12-year conservation agreement between ASF, our European partner the North Atlantic Salmon Fund, and Greenland commercial fishermen, the number of wild salmon returning to North America could increase starting in 2019. This article discusses just the Wild Atlantic salmon. However, it appears that some of the species of salmon are faring better than others. Through continued conservation efforts and smart, ethical efficient fishing and raising of salmon, they may be around for all future generations. Salmon is a great choice to have in any diet if you are wanting one source of food with so many benefits. Salmon is one of the healthiest foods you can eat. It has almost unparalleled benefits. If you have not ever tried it or have not eaten it in a while, today is a great day to get out and get some wild caught salmon and try the recipe in this post or find one of your own. I recommend grilling it. This fish is definitely one food choice to include on your journey to better health. Making salmon a regular part of your diet will allow you to reap its benefits for many years to come. For more foods with health benefits check out our articles on beans and blueberries. Please leave a comment or question. Let me know what you think of this post, tell me your story or share your favorite most delicious salmon (or favorite fish) recipe. So are you going to incorporate this superfood into your diet and enjoy its great taste and many benefits? Let me know. Also, tell me what you’d like to read about on our blog. Tell me a current problem you are having that I can help you solve.